What is Help Scout Docs? Help Scout Docs is what you're looking at right now! 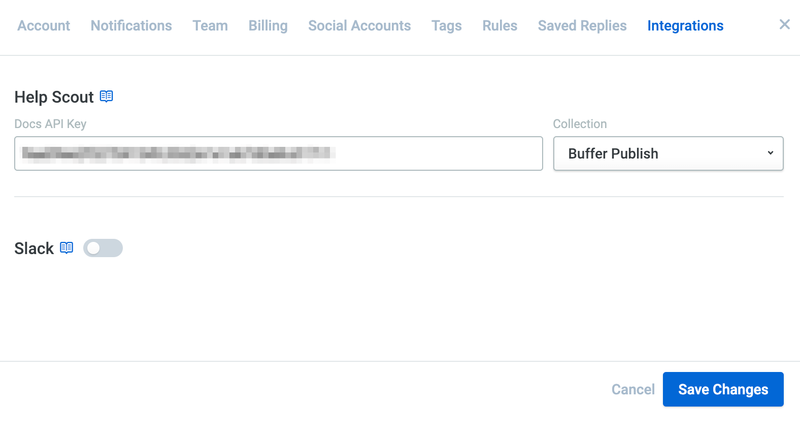 At Buffer, we use an awesome tool called Help Scout to manage all of our customer emails. An add-on that they offer is Docs, which allows you to create an FAQ site or Help Center. All of our FAQ articles, including the one you're reading right now, are created and hosted using Help Scout Docs. Learn more about Help Scout Docs here. If your team is using Help Scout Docs, you can integrate your account with Reply, allowing team members to easily insert articles within responses. This can give your customers an ever richer and more contextual experience. Insert your Help Scout API Key. To find your API key, log into your Help Scout account and click on the profile avatar at the top right of the page, and then click Your Profile from the drop down menu. Select Authentication on the left hand side, and then select the API Keys tab. You can then copy the API key under the Docs API section. Select the Collection you'd like to use. It is not possible to use multiple Collections at this time. We apologize for the lack of flexibility there. Once the Help Scout Docs integration has been configured, team members will be able to insert articles within their responses. There are two easy ways to insert an article into your response. Click on the Insert Help Scout Article option within the composer and select the article you'd like to use. Use the + shortcut, and using the up and down arrows on your keyboard, select the article you'd like to use. Linking to articles is helpful, especially on social media where character limits are in place, but similar to Saved Replies, try not to overuse them in your responses. The likelihood is that the user could have found your FAQ or Help Center online, but they chose to reach out for a human response. For complex questions, it usually works best to include a brief summary of the answer in your reply, and then share the link for more information, as shown in the example below.